General Lubrication There are 5 products. EP multifunctional grease enhanced by plastic deformation of micro additives and formulated for lubricating under harsh mechanical conditions and large frequency in lubrication periods. Maxigras 46/2 is a grease "moly" formulated with high refined base oils and developed to satisfy the most demanding services in automotive and industry. Maxigras T6 is a special high performance and universal application grease, formulated with anhydrous metallic thickener, synthetic bases and specially selected additives. Its excellent EP capacity to withstand heavy loads and high resistance to water allows its use in a wide range of applications. Maxigras C42/2 is a universal application grease. Formulated with mineral bases of high refined degree and anhydrous calcium thickener. 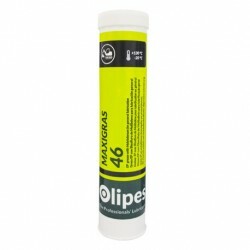 Maxigras C45 EP/3 is a EP multifunctional grease enhanced by plastic deformation of micro additives and formulated for lubricating under harsh mechanical conditions and large frequency in lubrication periods.